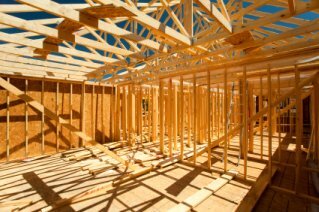 Framing carpentry or first fix carpentry generally includes all the big heavy structural carpentry jobs that take place before the plastering. A first fix/framing carpenters tools need to be strong and good quality to withstand the heavy work involved when working with heavy timbers, often outside in the rain. I use a much larger/heavier hammer and nail-guns than for finish carpentry and also a better quality tape measure. Don't be seen dead on site without your hard wearing carpenters pencils! Power your tools with 110v and grab a transformer so you don't electrocute yourself..
Noggins, otherwise known as blocking and bridging are used all over during framing carpentry to stiffen structures and to provide a fixing for sheet materials and more. There are a few types like straight and herringbone struts, click the link above for more info. The door lining must be fitted square, plumb and in wind so that the door functions properly and the architrave miters are quick and easy to get to fit perfectly. Sometimes part of the fine finish carpentry but these are also often installed during the framing stage so the plasterer can plaster around them neatly.